Push-pull or Push me/Pull me cards are a fun, innovative way to send someone a surprise message in a card. When you pull the tab on the right side of the card, a second tab on the left appears seemingly by magic. These fun cards can be made for any occasion and in any style. Use this easy technique to create one of your own. This card is made using regular cardstock, any embellishments you prefer and a few items you may already have around the house. 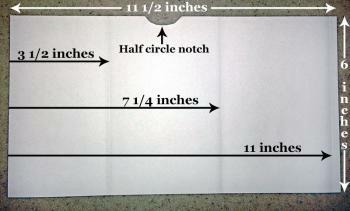 Take a piece of cardstock and cut it lengthwise so it measures 11 1/2 inches long and 6 inches wide. Lay the card horizontally in front of you and divide it vertically into sections. Draw the first line 3-1/2-inches from the left edge. Draw the second line 7-1/4-inches from the left, and the third line 11-inches from the left. Score the card along each of the three lines. This will give you three wide sections, and a very thin "flap" at the very end. Remove a half circle notch from the top of the middle wide section. This will allow you to grasp the pull tab on the card to operate it. Cut a piece of plastic shopping bag about 2 inches wide and roughly 13 inches long. 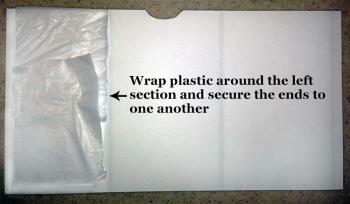 Wrap the bag around the far left section and secure the ends to one another - not to the card. You should be able to rotate the plastic around the card when you are done. Cut two tabs in your preferred color or colors to 3 1/4 by 6 inches. Decorate one end of each tab with your message or design. Take the first tab, the one that you will pull. Place it face up on top of the plastic shopping bag. 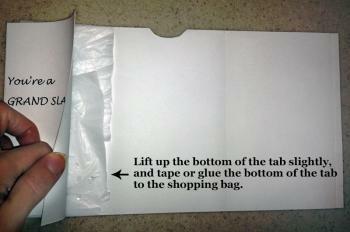 Lift up the bottom of the tab slightly, and tape or glue the bottom of the tab to the shopping bag. Turn the card over so the shopping bag is now on the right and your notch is at the top. 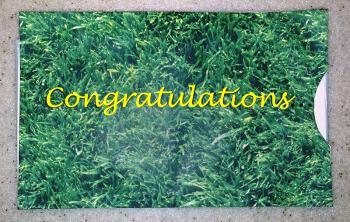 Place your second tab face down on the plastic shopping bag with your image at the bottom of the card. 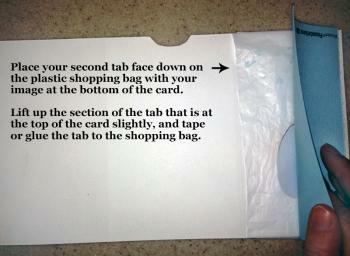 Lift up the section of the tab that is at the top of the card slightly, and tape or glue the tab to the shopping bag. Fold your card up along the scored lines and test the tabs to make sure they work. The mechanism will loosen up and get easier to push/pull once you've used it a few times. If it works well and the messages look like you want them to, run a bead of glue along the thin flap edge to seal the card shut. Decorate the front panel of your card however you like. Give or display your finished card. Push-pull cards are a fun way to deliver your message. Decorate or embellish them with creative designs to stamp personal style on the cards. If you are using expensive card stock, consider making a template first to ensure you are able to execute the card properly before moving on to your regular stock. 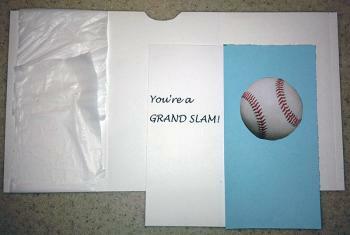 Give someone a push-pull card the next time you have occasion to make one, and surprise them with what's inside.